"On the Records: Fundraising Outside Texas" was first published by The Texas Tribune, a nonprofit, nonpartisan media organization that informs Texans — and engages with them — about public policy, politics, government and statewide issues. On the Records: Fundraising Outside Texas By Matt Stiles May 16, 2011 As we noted earlier this month, candidates in next year’s U.S. House and Senate elections in Texas raised more than $5 million in the first three months of 2011 to spend on advertising, staff and other campaign items. Most of the money raised from individual donors — not political action committees — was raised from Texans. But a significant portion came from outside the Lone Star State, according to detailed filings released by the Federal Election Commission. More than $700,000 — or one in seven of the dollars raised from individual donors — came from donors living in other states, largely on the East and West Coasts, the data show. Donors in California led the way, giving about $170,000, followed by those in Virginia, Washington, D.C. and New York. This national map above uses graduated symbols to display total fundraising by ZIP code prefixes, a grouping of contiguous geography based on the first-three digits of each code. Note the clusters of symbols in large population and power centers elsewhere. 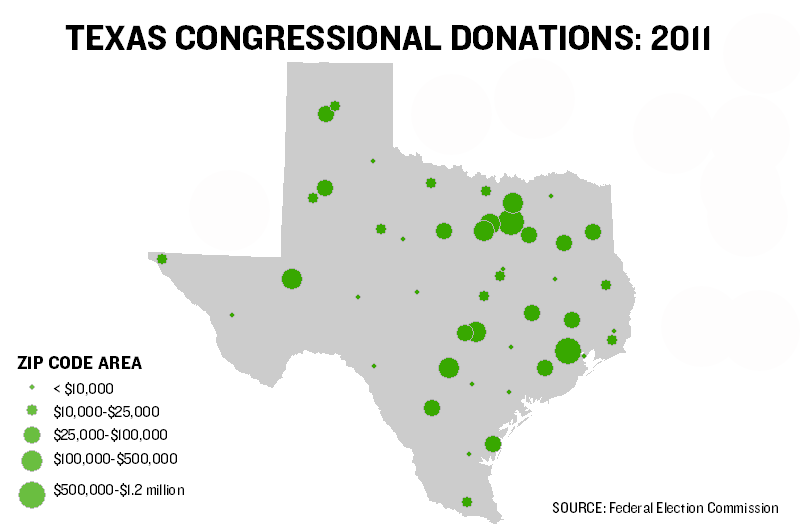 The Texas map shows what one might expect: Donations from come from the urban areas, which also have more of the type of wealthy professionals — business people, lawyers, etc. — who fund political campaigns. Donors from prefix 752xx (Dallas) sent the most money, about $1.2 million, followed by the central areas of Houston ($520,000), San Antonio ($415,000) and Fort Worth ($395,000): Here are the top Texas prefix totals in table form: ZIP AreaStatePopulationTotalArea 752 TX 1,359,291 $1,222,311 Dallas 770 TX 2,992,276 $528,518 Houston 782 TX 1,565,486 $415,248 San Antonio 761 TX 915,097 $395,884 Fort Worth 787 TX 982,765 $367,325 Austin 750 TX 2,118,393 $229,025 Dallas Suburbs 797 TX 378,670 $208,918 Midland 760 TX 1,174,259 $204,490 Fort Worth 757 TX 338,975 $82,650 Tyler 774 TX 984,844 $70,100 Katy 791 TX 221,169 $63,720 Amarillo 756 TX 329,338 $60,750 Longview 773 TX 1,063,878 $54,550 North Houston 794 TX 245,891 $52,950 Lubbock 784 TX 293,689 $47,550 Corpus Christi 778 TX 284,714 $37,126 Bryan 780 TX 534,053 $34,596 Laredo 751 TX 752,198 $30,075 Dallas 786 TX 856,727 $29,800 Austin And the top 20 national prefixes: ZIP AreaStatePopulationTotalArea 200 DC 600,670 $100,340 Metro Washington 100 NY 1,569,601 $44,800 New York City 221 VA 424,553 $31,150 Northern Virginia 941 CA 815,035 $26,350 San Franscico 220 VA 462,345 $25,750 Northern Virginia 222 VA 216,305 $24,944 Arlington 939 CA 397,484 $22,500 Salinas 223 VA 321,017 $20,050 Alexandria 926 CA 1,297,494 $19,000 Santa Ana 303 GA 1,049,667 $18,500 Atlanta 949 CA 383,354 $17,800 North Bay 208 MD 667,409 $16,738 Suburban D.C. 040 ME 343,457 $15,000 Portland 802 CO 1,013,896 $13,500 Denver 931 CA 188,175 $11,000 Santa Barbara 945 CA 2,281,691 $11,000 Oakland 600 IL 1,679,341 $10,250 Palatine 102 NY 7,356 $10,000 Staten Island 341 FL 386,673 $9,800 Fort Myers 553 MN 967,377 $9,600 Minneapolis Of course, such fundraising practices are perfectly legal, and not unexpected, but they are still worth highlighting. Let us know if you have feedback or ideas for other data-related content, and be sure to follow @TribData on Twitter for updates. Some notes about the data: The fundraising totals only reflect individual donations, not other types of campaign reciepts, such as loans or interest on investments with campaign funds. Also, candidates aren't required to itemize contributions from people who give less than $200. Texas Tribune donors or members may be quoted or mentioned in our stories, or may be the subject of them. For a complete list of contributors, click here. Reference Congressional Donations from Individuals: 2011 (803.5 KB) DOWNLOAD "On the Records: Fundraising Outside Texas" was first published at by The Texas Tribune, a nonprofit, nonpartisan media organization that informs Texans — and engages with them — about public policy, politics, government and statewide issues. Link back to the original article, which is located at https://www.texastribune.org/2011/05/16/outside-cash-funding-texas-congressional-races/.